Once again I am going to let the cantankerous Nebraskan make a guest editorial here on Denny Sinnoh’s Akihabara Starlight. Mr. Turbo? One of the most endearing moments in AKB history was Atsuko Maeda’s graduation and exit at the Tokyo Dome in the summer of 2012. The song is “Yume no Kawa” which translates as “River of Dreams”. Mr. Yasushi Akimoto wrote these lyrics for Atsuko’s graduation. Here is the YouTube link, however you must click on the CC button on YouTube if you want to see the English translation subtitles. You may also follow the lyrics on this from Stage 48 linked here. I will also include a higher quality video (1080) but with no English subs here. Acchan says a few words to the audience, then sings the song. The other members (Yuko, Haruna, Mayu, Mariko, Yuki, Miichan, Takamina, Jurina, Tomochin all join in. They pause the song near the end, so that each member can have a hug and say a farewell before Acchan gets in her gondola. Yuko and Minami lead her to the boat, and the song continues. There is a wonderful, bittersweet moment when Acchan begins to float away. Atsuko is crying so much that she can barely sing the lyrics. The song is about saying goodbye, she knows this, and is choking on her own tears. The other girls notice this, and although crying as well, they forcefully sing the chorus. It is a sweet moment that underscores the comradery the team had. Acchan composes herself, and sings the rest. As her gondola fades away, she sings “when my dreams come true, I will come back for you”. 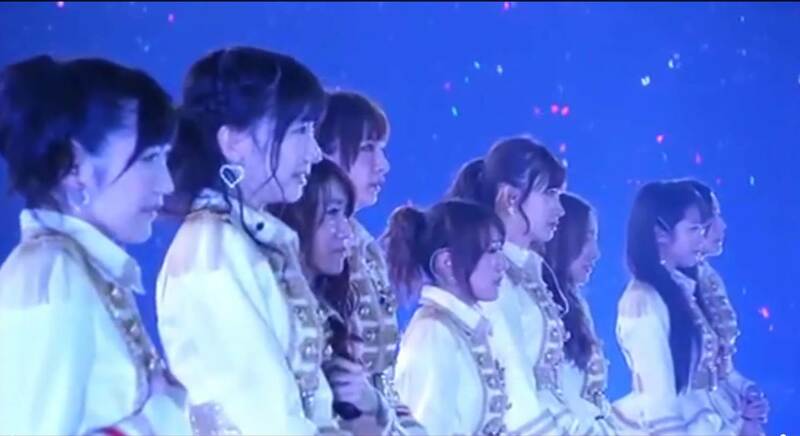 It should be noted that this is the actual moment that Atsuko left the group. This is not like The Rolling Stones, who have a farewell tour every year. What is Mick Jagger — 100 years old? … but I digress. When Ms. Maeda’s gondola exits the Tokyo Dome – that’s it — no more Acchan. Of course, when Atsuko’s gondola touches down outside the Tokyo Dome, she is no longer subject to AKB48 rules – if you catch my drift. I bet every Japanese actor, rock star and assistant prefect was there trying to get her number. Cantankerous old fans like myself see Acchan’s last performances as the peak of the group’s success. To many of us who enjoy the early AKB48 music videos, Atsuko Maeda is still the “face of AKB48”. She could never be fully replaced. Acchan’s departure would also start a wave of graduations. Several of the original members would leave the group within a year. 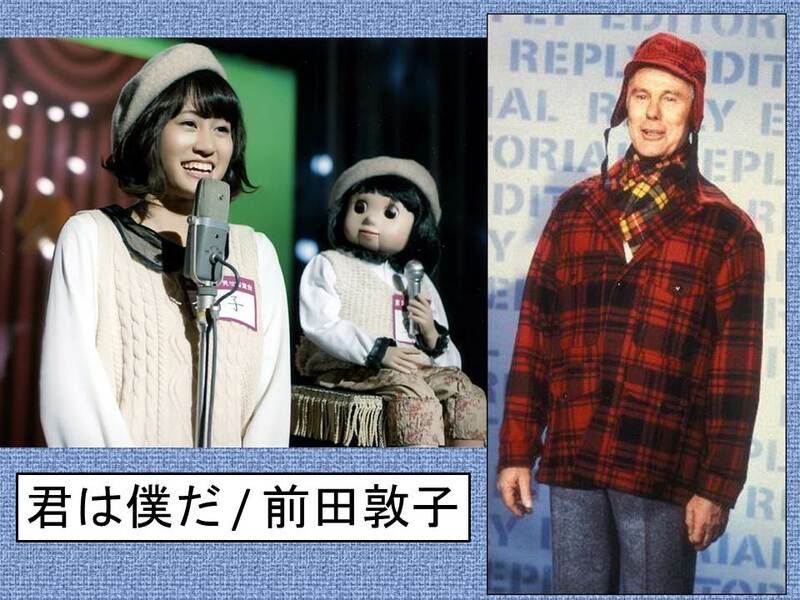 For more on AKB48 history, please read my AKB biography “Why I Like AKB48” subtitled by Mrs. Turbo as “Oh, You’re Stupid AND You’re a Pervert”. Thank you Mr. Turbo. I’m not crying, I have allergies. For more information on what Acchan has been up to, see my Atsuko Maeda page on Pinterest here.